"I can't make it to the festival every year but I never miss getting my fill of deep fried asparagus when it's in season." Heat peanut oil in a deep-fryer or large saucepan to 350 degrees F (175 degrees C). Mix flour, beer, cornstarch, egg whites, baking powder, white pepper, baking soda, celery salt, and black pepper together in a bowl with a wire whisk to form the batter. Dip asparagus spears individually in the batter and place carefully in the hot oil. Fry until golden brown, about 2 minutes. 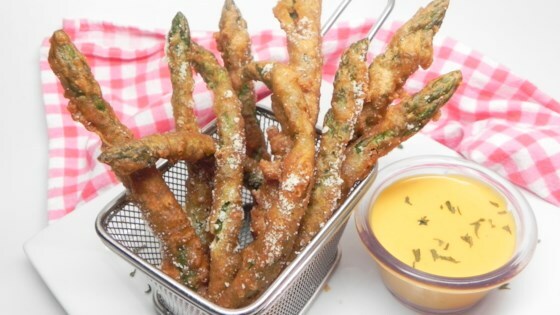 Dust fried asparagus with Parmesan cheese. See how to make an easy but elegant savory appetizer. 7 Up®, Mountain Dew®, or water can be used in place of beer. This batter is good for all kinds of veggies, including onions, zucchini, and cauliflower.